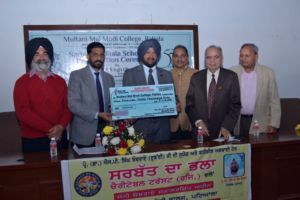 Multani Mal Modi College, Patiala organised a function where Dr. S. P. Singh Oberoi, founder of the ‘Sarbat Da Bhala Charitable Trust (Regd. )’ distributed scholarships to 53 students totaling Rs. 5,30,000/- for extending financial aid to the needy students. Principal Dr. Khushvinder Kumar welcomed Dr. Oberoi and other officials of the Trust and thanked the Trust for being very generous in granting these scholarships and contributing liberally for a noble cause consecutively for fourth year. Sh. M. L. Hasija, Director (Education) of the Trust talked about various activities where financial aid is given every year. He advised the students to work hard because the Trust is always ready to extend helping hand for the underprivileged but meritorious students. Prof. Nirmal Singh, Vice Principal presented the vote of thanks and hoped that the students will remember the role of this scholarship in their student life and always follow Dr. Oberoi as a role model in their life for philanthropic activities. A memento was presented to Dr. Oberoi on this occasion. Er. B. C. Sharma, an official of the Trust also attended the function. Prof. V. P. Sharma, Dean Students’ Welfare conducted the stage. 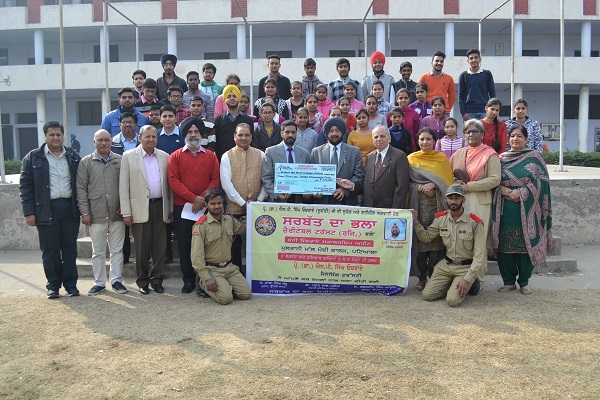 Prof. (Mrs.) Baljinder Kaur, Prof. (Mrs.) Shailendra Sidhu, Prof. (Mrs.) Neena Sareen and many other staff members and students were present.